This Christian tapestry "No Room at the Inn" shows the famous nativity scene of Christ. The baby Jesus is seen glowing with a bright white halo and aura, and his blue swaddling clothes, together with Mary's are lit up by this glow. In fact the entire scene is filled with the warmth of candle and burner lights softly illuminating all present including some children, farm animals including the donkey, sheep and goats. This scene is beautifully balanced in color and composition and shows the humble beginnings of the life of Christ. 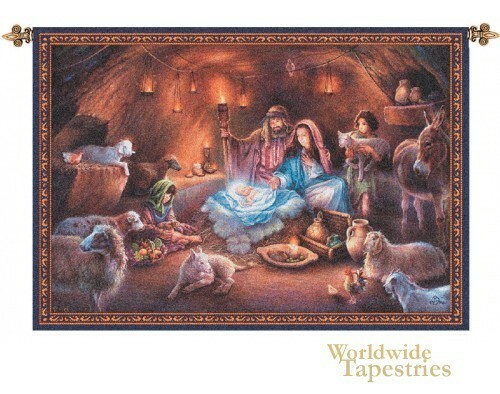 This Christian religious tapestry "No Room at the Inn" is lined and has a tunnel for easy hanging. Note: tapestry rods, where pictured, are not included in the price.